The still-new entrance to Bellevue Botanical Garden beckons with ever-changing wilderness — and free admission. A RAMBUNCTIOUS new planting is taking root at Bellevue Botanical Garden. Now, after its second summer, the Urban Meadow Garden is but a youngster in terms of landscape maturity — bursting with promise, with a few gaps yet to grow into. 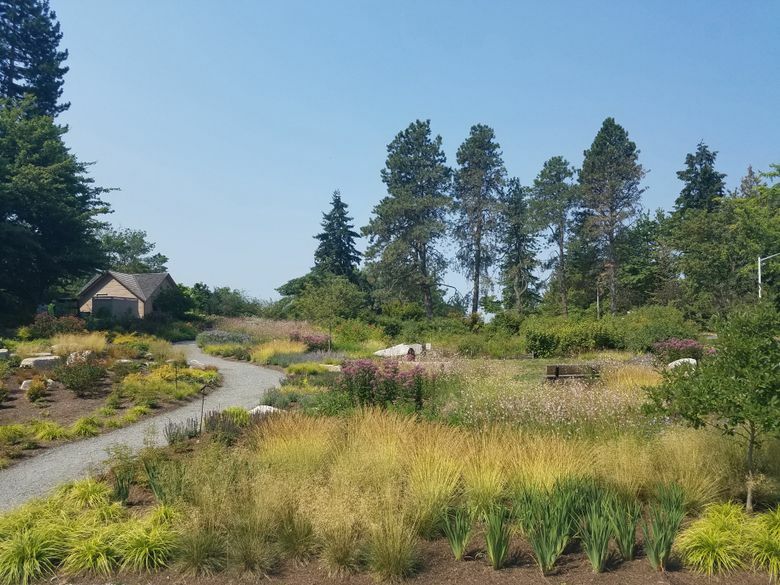 Situated to create a welcoming new entrance to 53 acres of ornamental gardens, woodlands trails and natural wetlands, the Urban Meadow Garden invites us all to go a little wild — literally. By design, the garden is a lively hybrid of human/nature. And boy, does it makes a ruckus. A crunchy gravel pathway anchored by impressive boulders wends through swaths of boldly blooming plants: an immersive environment of color and energy, set to a soundtrack of buzzing pollinators, birdsong and a vernal frog chorus. Urban Meadow Garden designer Jil Stenn describes the garden as a performance that plays out every day of the year. Visitors have responded in kind, noting how in addition to being beautiful, the garden makes them feel good. While no one is keeping a formal wildlife count, Kartes has observed countless birds, a spotted fawn and an “infinite” number of bunnies in the still-young landscape — see “lively” above. This past spring, a bumper crop of frogs, whose singing drew hundreds of visitors to the edge of the wetland, forced staff to rope off an area in order to protect plants from the onslaught. Like kids, new gardens require careful tending. For now, maintenance consists of cutting back spent perennials, weeding and watering. Chemicals are rarely used at BBG and especially not in this area of the garden designed to attract pollinators and wildlife. As the meadow matures and the resilient plants knit together, weeding and watering chores will taper, and the landscape will require fewer inputs. All of the remarkable gardens at BBG rely on collaboration between the City of Bellevue and various regional garden organizations that partner with the nonprofit Bellevue Botanical Garden Society to develop and maintain the beautiful displays. The new Urban Meadow Garden is no exception. Bellevue Botanical Garden is open daily, including holidays, from dawn to dusk, and is one of the few botanical gardens in the country where admission is free. Check out the Urban Meadow Garden, and go a little wild — take the kids; they’ll feel right at home.